The above photo shows a 43 years old spiral staircase leading to nowhere. Guess where is this place located and what building is this. Clue : There are 2 such staircase in that place! Note : I’ll blog about this place soon. Lion City Hotel on plot bounded by Tanjong Katong Road/Changi Road/Haig Road? You are fast and accurate Victor! Really an ‘old bird’ in this field. Good try but wrong. I’ll blog about this place asap. Hi Long time now see. Welcome back to the blogosphere. Same to Victor. Thanks Chun See, hope to blog more frequently too. 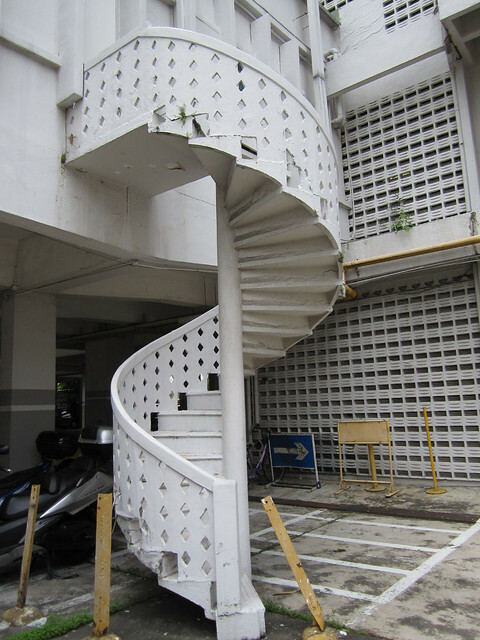 i think victoria school in tyrwitt road has this staircase…i wonder if it is still there? I have been trying to figure out a game for our family and friends to play on our blog….to figure out where we are in our road trip around the US….the pictures and detailed description without giving the location away is a great idea! and I LOVE the picture….there’s just something about spiral staircases!! There used to be a spiral staircase at the Capital cinema leading down from the balcony seats that was used as an “outside”exit after evening performances rather than coming down the stairway and into the booking hall. I don’t know if it is still there. It was, last time I looked.